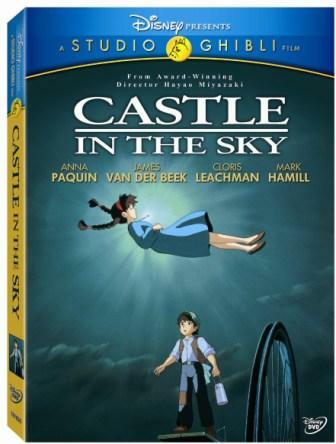 OVERVIEW: CASTLE IN THE SKY: SPECIAL EDITION: Introduce your entire family to Castle In The Sky: Special Edition, featuring a timeless story of courage and friendship with stunning animation from acclaimed Academy-Award®-winning* director Hayao Miyazaki. Plus, this 2-Disc Special Edition DVD included never-before-seen bonus features that transport you deeper into the film’s amazing world! This high-flying adventure begins when Pazu, an engineer’s apprentice, finds a young girl, Sheeta, floating down from the sky, wearing a glowing pendant. Together, they discover both are searching for a legendary floating castle, Laputa, and vow to unravel the mystery of the luminous crystal around Sheeta’s neck. Their quest won’t be easy, however. There are greedy air pirates, secret government agents and astounding obstacles to keep them from the truth—and from each other. 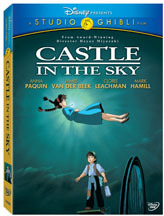 Add Castle In The Sky: Special Edition to your DVD library, and this magical and uplifting classic will thrill and amaze your family for years to come! REVIEW: It is official, March 2nd is Ghibli day, or at least that is what I understand from Disney. With the upcoming release of the tenth Miyazaki production, Ponyo, it seems that those guys from marketing decided to target the Japanese director new fan’s as well as the already admirers a chance to add to their collection three of Miyazaki’s earlier masterpieces digitally remastered: Kiki Delivery Service, My Neighbor Totoro, and Castle in the Sky, This last one being one of my favorites along with Howl’s Moving Castle. It is characteristic of Miyazaki’s production to take place in incredible and beautiful worlds full of creative places, ingenious nature oriented machines, and colorful characters; it seems that for the Japanese director not even the sky is the limit. In Castle in the sky we get to see imagination at is best, presenting gorgeous settings, designs, and a mesmerizing story. Unlike Kiki Delivery Service, Ponyo, and My Neighbor Totoro, the movie has a faster pace, it has it all: romance, adventure, action, magic, some humor, pirates, huge aircrafts, heroes, and villains. This movie definitely seems to be targeted to an older audience; nonetheless, younger audiences would enjoy as well. Like all Ghibli movies being released in March 2nd, Castle in the Sky excels in special features. It has everything the old releases had (which was not much) plus additional interviews with Hayao Miyazaki about how the movie came to be. Also the new re- mastered surround sound is excellent. The voices are the same as the previous Disney release, but what really is entertaining is The Enter the Lands featurette, where you can explore the different movies and discover which character you are more alike. Castle in the Sky is without a doubt a timeless classic, it has been 20 years since its release, and like many Walt Disney Classics this one still has not lost its magic. Its animation is superb, the characters are memorable and like all Ghibli productions it just looks extraordinary. It is also the perfect blend between little kid’s innocence with teenager adventurous material, in my opinion it is more complete than Ponyo and as Exciting as Howl’s moving Castle and Princess Monanoke. It is without a must have for fans of animation, either you prefer the magical world of Disney, or the excitement of Asian anime this DVD would definitely satisfy you. BONUS FEATURES: Special features wise this release beats its predecessor, it has actual interesting features about this movie and other Miyuzaki’s movies. It even has interactive games, the interviews are also interesting where he explains his connection with nature and how it inspires him to create this wonderful worlds. Kikis Delivery Service Land : See a brief summary of the movie’s plot and a character explanation to hear its story. Ponyo Land: See a brief summary of the movie’s plot and a character explanation to hear its story. My Neighbor Totoro Land: you get to see an explanation of the different characters and some clips from the movies. In Castle in the Sky Land: section there is a kind of test to see which character you are the most compatible.